urtis L. Carlson used a $55 loan in 1938 to start his family fortune. His Gold Bond Stamp Company quickly became a household name across the United States. His Minnesota-based venture, under the Carlson family name, has grown into one of America’s largest family-owned companies. Carlson employs more than 100,000 people worldwide, in 1,300 hotels and through its global travel management company. In 2014, the company generated $35 billion in revenue. The third to helm the company’s board, Diana Nelson ’89, is following in the footsteps of her grandfather and mother. Since assuming the chairmanship in 2013, she has reshaped the company’s portfolio to secure company profitability and sustainability for future generations. 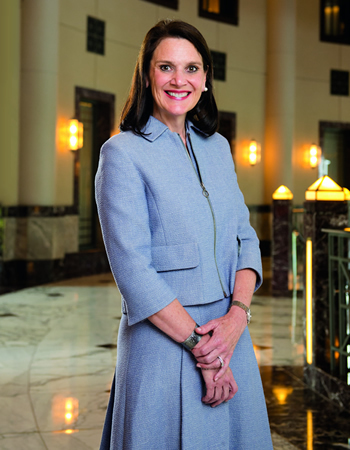 A key role as chair of the board, she says, is keeping her board, senior management and family shareholders in alignment — a collaborative approach that she says was reinforced at Kellogg. One of her first tasks was to launch a data-driven and analytical review of the company’s portfolio and structure. The review led to the decision in 2013 to shed its TGI Fridays restaurants and refocus on its travel and hotel operations. “It was difficult to let it go emotionally,” she says, noting that her grandfather grew the TGI Fridays brand from 13 restaurants to more than 1,000. “But analytically, it was much easier to make that decision. "What I hope comes out of my leadership is the courage to change and innovate. You can’t be afraid to reinvent." After shedding its restaurant businesses, Carlson assumed full ownership of Carlson Wagonlit, the company’s travel unit, by acquiring the minority stake from JPMorgan Chase. After reviewing its portfolio, the board also moved to restructure its governance after the retirement of its chief executive officer. Instead of one companywide CEO, Carlson appointed separate CEOs for each of its two remaining core platforms. This gave each more autonomy to make them more nimble in addressing specific challenges for each industry, including confronting the shifting tastes and needs of their respective customers. What hasn’t changed, she says, is the company’s mission —including her grandfather’s commitment to social responsibility.